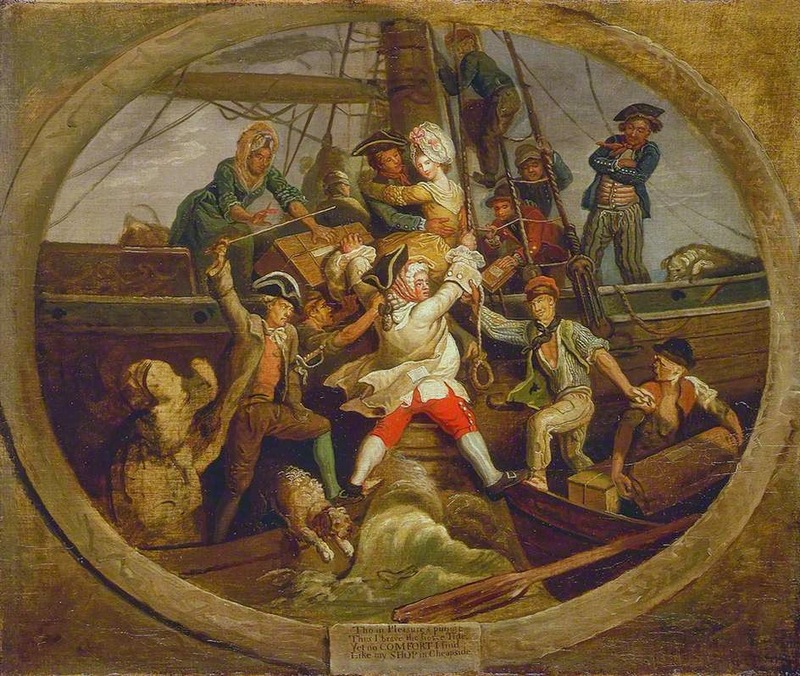 "The Embarkation," John Collet, c. 1760's, National Maritime Museum. In this colorful, but unfinished piece by Collet, a portly landsman tries to climb aboard a vessel with his feet divided by two boats. While he struggles, a sailor takes the lovely lady above him into his arms, and giving her a none too innocent glance. The sailor embracing the woman wears a cocked hat trimmed in white with the point forward. His blue jacket has slash cuffs with three large buttons which are either white metal or cloth covered. At his neck is a solid red neckcloth. To left is another tar reaching through the shrouds with some mail, or perhaps taking a book that the unlucky passenger had unwisely clasped to while trying to board. It appears that the sailor is wearing a black "jockey" style cap. His jacket is red with brass buttons. Behind him is a shipmate with an off white cap, possibly a workman's cap or knit cap. His jacket is also blue, though definitely with white metal buttons. Forward of these two is another salty fellow with his arms crossed. His cocked hat is reversed, and he wears a red neckcloth. Beneath his blue jacket with white metal buttons and slash cuffs is a waistcoat with narrow and horizontal red stripes. 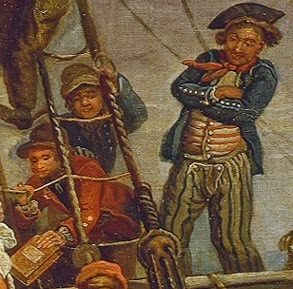 Most interesting are his trousers: very few images of sailors show any color in their striping save for red. On top of that, we see very clearly a broad fall fly, whereas most sailors' trousers show no detail in the fly at all. Quite a treat! Above them climbs a tar in a pair of trousers, a blue jacket and some unidentifiable cap. Below these tars in the boat are a pair of mariners trying to load some dunnage. At the bow is a sailor offering the slightest of hands to the distressed landsman. 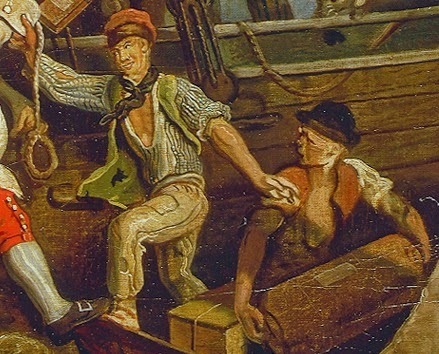 Our seaman wears an odd black and red cap, not unlike that worn by the marines in Gabriel Bray's work aboard the Pallas. This jack is weather beaten: his trousers are patched, his green waistcoat has a gaping hole, and his blue checked shirt is stained. Clutching a box is a half complete sailor. Atop his head is a black round hat with a very narrow brim, and he wears an open red waistcoat. Little more can be said about the figure, as this painting will forever remain unfinished.